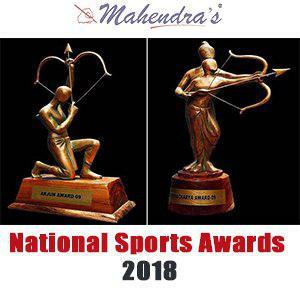 Here we are providing you a list of National Sports Awards-2018.National Sports Awards are given every year to recognize and reward excellence in sports. Rajiv Gandhi Khel Ratna Award is given for the spectacular and most outstanding performance in the field of sports by a sportsperson over a period of four year, Arjuna Award is given for consistency outstanding performance for four years, Dronacharya Award for coaches for producing medal winners at prestigious International sports events, Dhyan Chand Award for life time contribution to sports development and Rashtriya Khel Protsahan Puruskar is given to the corporate entities (both in private and public sector) and individuals who have played a visible role in the area of sports promotion and development. Overall top performing university in inter-university tournaments is given Maulana Abul Kalam Azad (MAKA) Trophy.